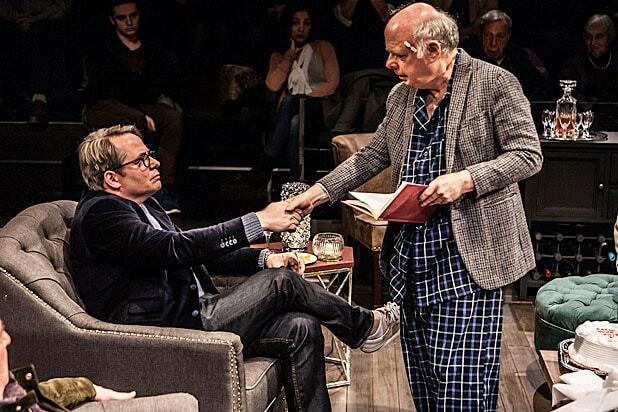 Wallace Shawn writes one truly brilliant moment in his new play, “Evening at the Talk House,” which opened Thursday under the auspices of the New Group at the Pershing Square Signature Center in New York. Shawn the playwright is clearly referencing Shawn the actor here, and the line delivers the intended laughter of acknowledgement from the New Group audience. For some people, this playwright and actor epitomizes the inverse of that line from the Kander and Ebb song “New York, New York.” Shawn is the kind of quirky acquired-taste talent who can only make it here. Broderick is especially good at never losing his benign cool while delivering wicked character critiques that savage like an assassin’s bullets. And Shawn and director Scott Elliott are especially adept at scene-setting in the play’s first few minutes. Where he goes off the rails is with his twist, which recalls a famed “Twilight Zone” episode from 1964. In “Masks,” family members don Mardi Gras masks that reveal their greed and nastiness only to find they can’t remove the masks at the end of the evening. That conceit is far more inventive than Shawn’s. Also, once the twist is revealed in “Masks,” the show is over, after half an hour. The 100-minute “Talk House” meanders on and on after the big reveal, with characters being alternately nonplussed and nonchalant. Two characters (played by Jill Eikenberry and John Epperson) sing and play the piano. Shawn’s character delivers a long reading from “Midnight in a Clear with Moon and Stars,” which reveals, unintentionally perhaps, why it had a very short run on Broadway. Why the “Midnight” company decides to return to the “Talk House” to celebrate the play’s 10th anniversary is the much bigger mystery that goes unsolved.